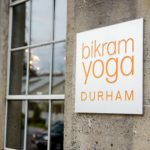 Bikram yoga is a sequence of 26 Hatha yoga postures and 2 breathing exercises practiced in a heated room to stretch and strengthen every muscle, tendon, ligament, gland, joint, and organ in the body. The series systematically moves fresh oxygenated blood throughout the body to detoxify and restore your body to its natural, perfect condition — without machines, drugs, or injury. The room is heated to 105°F to promote deep stretching, rapid detoxification, and increased heart rate for a cardiovascular workout.